Tabs are bigger than people realize. Despite the profusion of Android tablets we saw at CES, Chris Whitmore from Deutsche Bank doesn't think Apple has anything to worry about in terms of iPad competition. In his note to clients today, he said that Android tablets had failed to perform as expect, and that "this year, tablets had a much smaller presence as vendors appear to be placing greater emphasis on Windows 8." 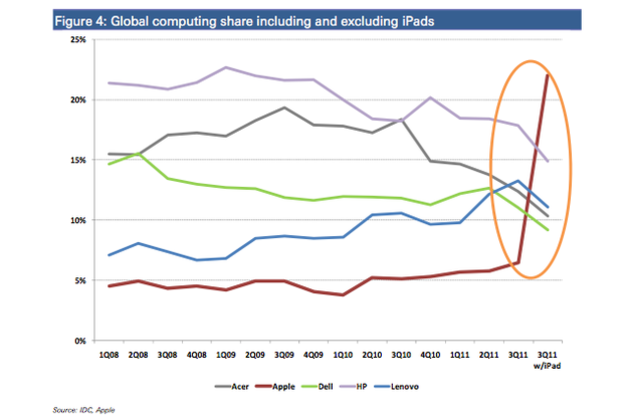 Because of the development time required, Whitmore expects "the move away from Android tablet investment and a slow ramp of Win 8 tablets to create a favorable competitive backdrop for Apple's forthcoming iPad 3."